In their natural habitat hamsters eat grasses, seeds and grain. Although they are often mistaken as herbivores, they are omnivores and need protein in their diet to keep them healthy. 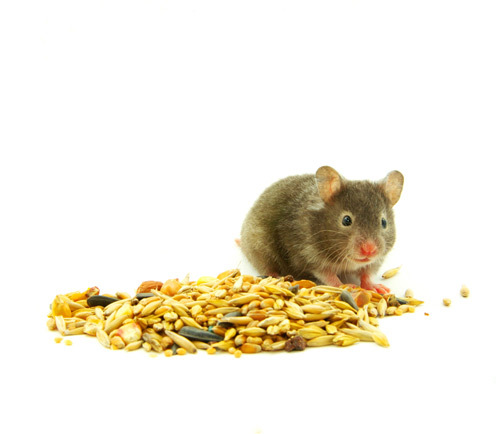 Hamsters need feeding every day and as they are nocturnal creatures, an evening feed is ideal. A heavy, earthenware bowl is best to keep the food dry – it will need to be cleaned daily. Hamsters have delicate cheek pouches so be careful how you feed them. Do not give foods that contain whole oats as these can puncture pouches. Also avoid sticky foods, as these stick to their pouches. The list is not exhaustive, and if in doubt as to whether something is safe to feed it is best to avoid. Hamsters have teeth which grow continually. If fed unsuitable foods, these fail to wear the teeth sufficiently and this can lead to painful dental conditions. Plenty of hay and safe twigs to chew are a good idea. Failure to feed them with the right diet can result in serious dental disease. Your hamster may like an occasional treat, such as a small piece of fruit or vegetable – but too much green food can cause diarrhoea. Don't feed too many treats as even hamsters can get eat too much and become overweight, this can lead to many other health problems. There are a number of nutritionally balanced diets for hamsters on the market. Manufacturers have experts available to provide you with advice on what you should buy for your pet and how to feed, so contact them direct for further advice on specific products. A list of PFMA members who produce pet food for small furries can be found here.